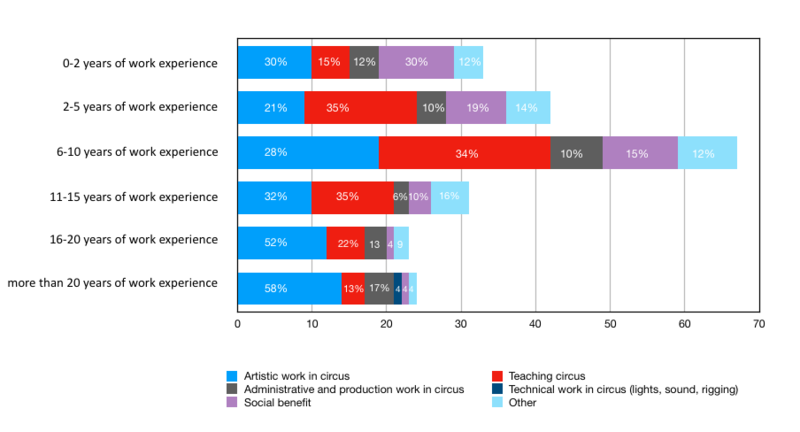 CircusInfo Finland and The Finnish Youth Circus Association surveyed the number and job titles of professionals working in the field of circus. The survey spanned the year 2017. Data was collected from the largest employers in the field, from vocational institutions and youth circuses, and by inviting individuals working in the field to answer a questionnaire. 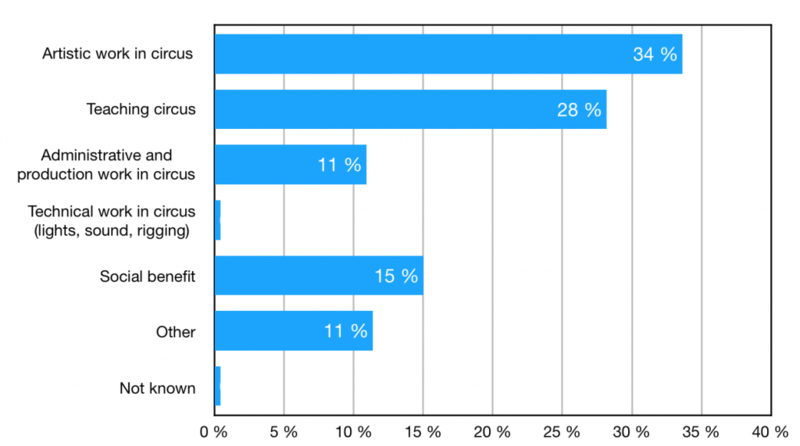 CircusInfo Finland conducted the survey in 2018. The Finnish Youth Circus Association conducted an employee survey among its member organizations. Arts Promotion Centre Finland provided help and expertise at different stages. There are no compiled statistics of professionals working in the circus sector in Finland. Statistics produced by Statistics Finland do not differentiate between circus professionals and professionals in other cultural fields. 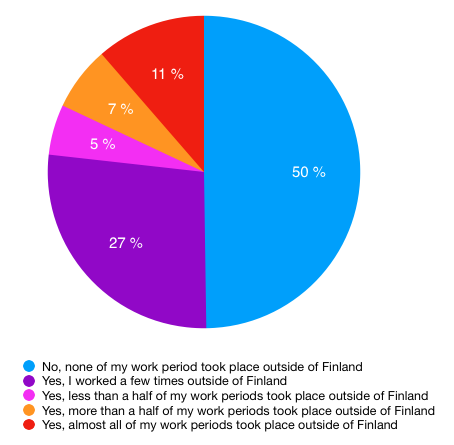 Arts Promotion Centre Finland does compile statistics of grant applicants by cultural field. Since only part of professionals working in the circus sector apply for grants, the grant applications received by Arts Promotion Centre Finland do not give a truthful and comprehensive view of the employment status or jobs titles of circus professionals. The circus sector has grown, changed and become more versatile over the past ten years. Circus has grown both in relevance and numbers, be it as part of performing arts, basic arts education or the physical and artistic leisure time activities of Finns. The survey aimed to update data on the number of professionals working in the field and to form a picture of the circus sector as employer in Finland in 2017. The survey gathered data on circus as job creator from the largest employers in the field: youth circuses, educational institutions that offer a degree in circus arts, circus companies that receive government subsidies and the Cirko – Center for New Circus, Dance Theatre Hurjaruuth, traditional circuses, CircusInfo Finland and The Finnish Youth Circus Association. The circus sector employers surveyed offered a total of 1243 employment contracts in 2017. A total of 99 employees (8% of contracts) were full-time. Of the full-time employees, 69 worked in one of 17 youth circuses 3 worked in one of the two educational institutions that offer a degree in circus arts, 6 in either Cirko – Center for New Circus or one of three circus companies, 8 in Dance Theatre Hurjaruuth, 9 in one of two traditional circuses, and 4 in two different circus organizations. Part-time, fixed-term or atypical employment contracts accounted for 92% of all contracts (1144 employment contracts in all). Of the part-time, fixed-term, or short-term employees, 566 worked in one of the 43 youth circuses surveyed, 326 in Cirko – Center for New Circus or in one of the ten circus companies surveyed, 103 with Dance Theatre Hurjaruuth, 85 in one of the two traditional circuses, 29 in one of the two educational institutions and 35 in one of the two circus organizations. 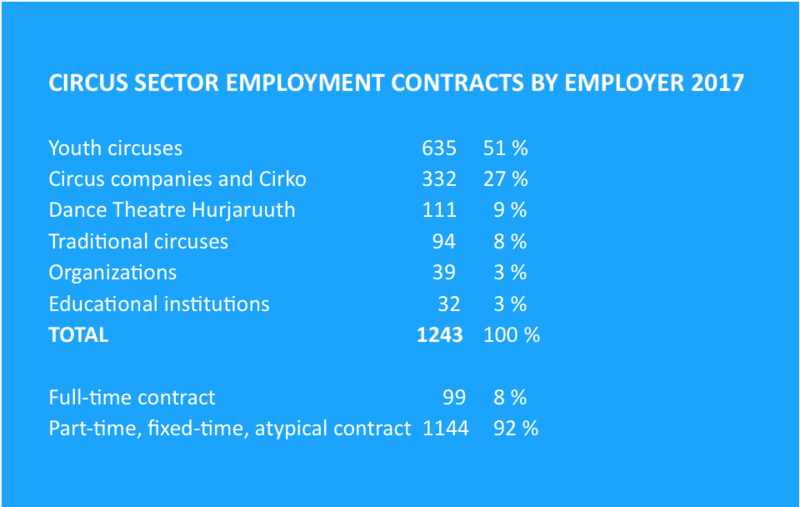 The number of contracts does not reflect the number of professionals employed in the field of circus, since the data does not account for overlaps. Individuals surveyed may have worked in multiple organizations over the course of twelve months while both performing and teaching. The data does, however, help form an indicative picture of the volume of circus as employer in Finland. A closer look at the number of individuals with a degree in circus and data gathered from professionals surveyed complements the picture. Figure 1. Professionals with vocational education and training, total 318 persons. The survey on individuals with vocational education and training in circus arts identified 318 Finns or foreign nationals working in Finland in 2017 who had received vocational education in the field. A total of 264 individuals had graduated from either Salpaus Further Education or the Arts Academy of Turku University of Applied Sciences (and their predecessors) between 1994 and 2017. In addition, four professionals had studied in Finland without earning a degree, and 93 had received vocational training abroad, 43 of whom had also studied in Finland. Two Arts Council of Finland reports, by Merja Heikkinen in 1999 and Riikka Åstrand in 2010, have touched upon the number of professionals working in the field of circus in Finland. Heikkinen surveyed the 134 members of artist organizations in 1998. Åstrand’s survey, conducted in 2008, covered 205 individuals who had either gained a degree in or were currently studying circus arts. Our 2017 survey identified 318 individuals with vocational education and training in circus arts and/or pedagogy, a gain of 100 in ten years. Self-education is one way to enter the field. Furthermore, individuals with an education outside the circus sector may work in administrative and production jobs or in pedagogy. A survey targeted at professionals aimed to expand the overall picture. The average age of respondents was 37 years. 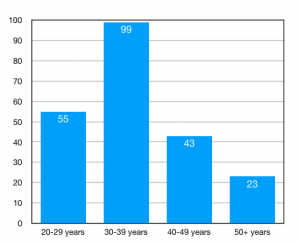 The largest age bracket was 30-39 years (45% of respondents), followed by 20-29 years (25%). A majority of respondents lived in the Helsinki metropolitan area; 9.5% of respondents lived abroad. A majority (65%) had worked in the field for less than ten years, and 35% more than ten years. There was a significant overrepresentation of women in the less than ten years in the field cohort compared to the 10+ years cohort. 192 out of the 220 professionals worked in artistic or pedagogic jobs. 133 had vocational education and training, and 31% (59 individuals) worked in the field without having earned a degree in circus arts. Three out of four professionals without a degree in circus had a vocational degree from another field of study. 45% of respondents had self-learned and 39% had received on-the-job training. 35% of respondents had a background in youth circus. Circus is a polymorphous field and jobs within the field reflect this versatility and diversity. Respondents named a total of 85 different job titles. The most cited were circus artist, teacher, performer, air acrobat, producer, magician, director, circus teacher and circus director. Circa half of job titles cited in the responses were performance-related. In addition to the aforementioned, titles included base, hair hanger, interprète, foot juggler, juggler, clown, flier, tightwire dancer, magician, and hoop dancer. 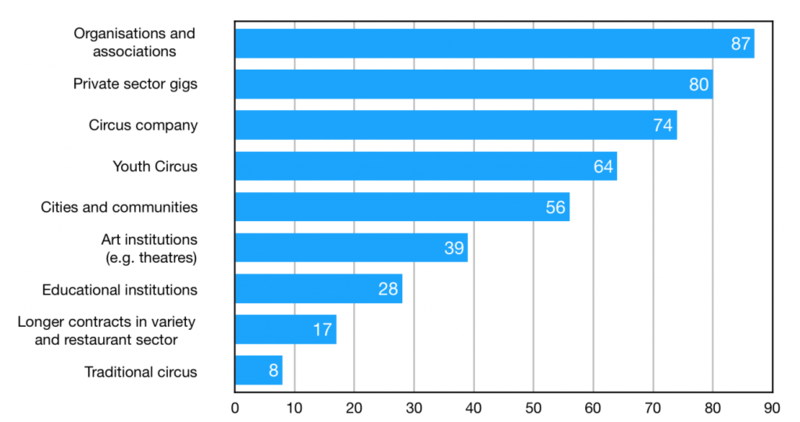 Titles related to teaching and applied use of circus were cited 69 times (23%) and five times, respectively. The titles of artistic or circus director were cited eight times. Administrative and production work related titles were cited 32 times, and titles related to other arts were mentioned 16 times (i.a. choreographer, set designer, music and sound editor, actor, costume designer, composer, dance artist and teacher, light designer). Figure 5. The primary source of income. 220 responses. The responses are in line with data provided by employers. Permanent employment in the field is associated with jobs in teaching and administration. Artistic work is almost exclusively fixed-term. Both the responses to the survey and data provided by employers highlighted the prominence of atypical employment contracts in the field. Close to half of respondents said they also worked jobs outside the field. A third had been unemployed. Close to 50% of respondents reported having worked without pay. Unpaid work included technique rehearsals, rehearsing for a new project or production, and creative and artistic work. Administrative and production jobs could include doing unpaid work. Some of hauling, rigging, and service and maintenance related work was done without pay. Some of the unpaid work was voluntary or communal work, or work done in a position of responsibility. The survey also highlighted how grants do not cover all work. Funds available often cover no more than performers’ salaries, and all other production related work is done without pay. Organizations and associations along with circus companies and youth circuses were the most often cited job opportunity providers. They accounted for 50% of the responses to the multiple-choice question. Private sector gigs and odd jobs accounted for 17% of responses to the question. Typically, circus organizations are independent arts sector organizations, companies and youth circuses. Their impact as job creators became evident in the question about job opportunity providers. Of the 453 responses to the multiple-choice question, 50% cited organizations and associations, circus companies or youth circuses. Performing at company parties and corporate events is an important source of income. Private sector gigs and odd jobs were cited as the most important job opportunity in 80 responses (17%). Figure 8. The most important job opportunity providers for you in 2017. 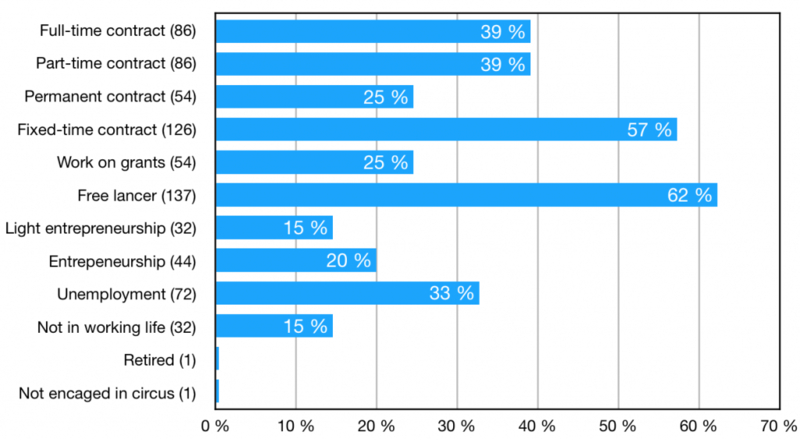 The survey revealed how a substantial part of job opportunities are jobs outside Finland. Half of respondents said they had worked abroad in 2017. 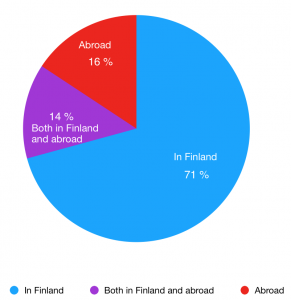 Half of those who had worked abroad had worked for a foreign employer and the other half for a Finnish employer. For 11% of respondents, almost all jobs in 2017 had been outside Finland. (Figure 9.) 11% of respondents reported living abroad. Figure 9. Did you work outside of Finland in a circus profession in 2017? > Read the full-lenght report in Finnish.